Cambodia was a country we planned to do for one reason and that was Angkor Wat, but we decided we should do this country some justice and see at least some of the countryside as we traveled from the Border with Vietnam to Phnom Penh (PP) and then again onto Siem Reap. We had been told to be careful with food in Cambodia especially meat due to hygiene issues but that was about it. But on crossing the border we were presented with our first interesting sight with what appeared to be the Cambodian Strip. 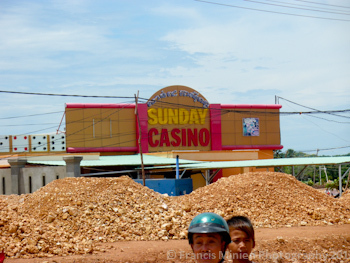 Sandwiched in no mans land was South East Asians Casino haven, just nestled behind the Cambodia Border Crossing Office was the Start of the Strip with “Hatien Vegas” Casino! On our way again from the border we stumbled across our usual SE Asian con where we were off’ed from the ‘luxury’ mini bus we had paid for and onto a public bus to PP! Go figure! On our way again there was not much to report except the country was pretty flat with limited agriculture happening on vast swathes of arable land! The highlight before we did reach PP was a pit stop we took at a local restaurant. I went to go to the toilet round the back of the restaurant; first thing I noticed was the proximity of the filthy and stinky toilets to the kitchen. Then I noticed that in fact the meat looks like it was be butchered right next to the toilets, separated by a mere 5 metre’s was a platform stained in blood with flies swarming all over the area! Lying on the surface was two of those sticky fly paper traps, from where I stood, they were dark in color, I took a step closer and realized they were once orange and where in fact completely covered with dead flies, both sides! That was my time to exit, I walked back round the front and watched how half the contingent on the bus were ordering various meat dishes, I had to withdraw to the bus! Vegetarian it is then!